The Sixth Season of Glee. I try so hard to like Glee. It went from bad to good. Then it was bad. After awhile, it was okay. Then it was really great. And now, it’s just horrible. This sixth season started out strong. I liked Klaine being apart. It’s realistic. And it causes conflict, which a show needs. Blaine dating Dave was fascinating. It opened the door to exploring Dave’s character, and to possibly dive into why he was so depressed before. I was happy Rachel was heading back to help with the Glee club. I liked how her tv show didn’t work out. She didn’t let it break her. Will being at another school and having a son was cool too. I was hoping we’d see him as a father more. The new Footballer player who was the “modern gay” seemed promising. (Spencer.) Would he try to entice Kurt? Coach Beast wanting to be a male didn’t really fit with her previous established arcs, but I was willing to forgive that. But this last episode, “The Hurt Locker, Part 1” really, really threw me. My main issue was the structure of the episode. The characters are at the invitational. And then, BOOM: Sam and Rachel are out to dinner. What was the reason for this dinner? Why were they suddenly with each other, alone? The fact the characters were together was strange and the sudden cut to the dinner seemed like an editing mistake. Sue’s behavior in this episode was unforgivably silly. Yes, the character practically sits in the melodrama category. But, this episode went just too far. 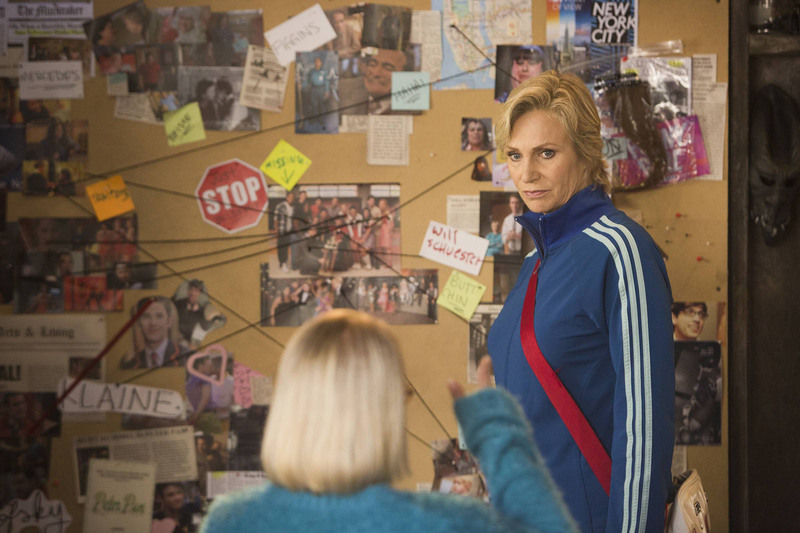 She’s got a shed full of photos of Will and ships Klaine to the point of having a giant photo of them? I mean, come on! That’s just absolutely ridiculous. Sue hypnotizing Sam had its moments. But, for me, the show decided to completely turn fantasy and I just can’t stand it shifting its tone once again. I did chuckle when Sue glided behind Rachel, though. I’ll admit. Lastly, the show decided to toss away Marley and Ryder. Melissa and Blake are extremely talented actors. Those characters did wonders for the show. Alex Newell, even. The arc of Unique catfishing Ryder… I mean, these are the sort of plots that grounded Glee into reality. The drama was real and fresh. Now, it’s just a circus. A show can be silly. It doesn’t have to be completely realistic. But, when a show constantly shifts tone, drops characters and plots—- it just feels like a preschoolers art project. All thrown together with no thought, whatsoever. When you think gripping scripted television, VH1 is probably not a network that you’d think would air it. But yes, much like BRAVO, VH1 is now taking a chance at producing scripted drama, as opposed to another reality show. HINDSIGHT is about a woman who wishes she could do her life over. She’s about to marry for the second time, her best friend hasn’t spoken to her in years and her mother is extremely critical of her choices. After a brief conversation about “accepting life for what it is” with a stranger, she wakes up twenty years ago, in 1995. The concept is genius. While time travel is a common fixture in media, we really haven’t seen this kind of thing before. You had 13 going on 30, which went forward— and you did have Back to the Future. But what HINDSIGHT aims to explore is the ability to correct past mistakes. It’s probably something many of us have thought about. I know I have. I know the moment in my life where I said “yes” instead of “no”, and that changed my life forever. And not in a good way. But Rebecca, our main character, mysteriously finds herself in 1995 after an elevator ride gone awry. She wakes up in bed and wanders into the kitchen, unable to find the coffee maker. When she opens the double doors to the living room, there’s a lot of people rushing— and she realizes, it’s the wedding day of her FIRST marriage, and she now has the chance to do things differently. Where Hindsight goes wrong, and could possibly be its downfall, is its lack of sincerity. What I mean is, the show often plays like a silly comedy, right down to a music score you’d find on The Mentalist. The ending scene of the pilot has this great set up where Rebecca and her friend Lolly are running away from a tense situation. But, the moment virtually pauses, so we can “get a laugh” with Rebecca’s boss, who is humorously on the phone when he shouldn’t be. The show works best when it tries to ground itself and be serious. For example, there’s a scene where Rebecca’s mother gives her a bracelet to wear for the wedding. Rebecca is shocked, because, when her wedding day happened the first time, her mother never gave her this bracelet. Then, there’s the mysterious stranger who Rebecca talks with in present day, who she then meets in 1995. He’s sort of got a “guardian angel” vibe going on. In 1995, there are two supporting characters that seem to be prevalent. Lolly, Rebecca’s best friend (played by Sarah Goldberg) and Sean, Rebecca’s first husband. (Played by Craig Horner.) Lolly’s story deals with a mysterious fight she and Rebecca will have in the future that will end their friendship. Rebecca aims to never let that fight occur, saving the friendship. Where Sean is concerned, Rebecca married him simply because he was good in bed. But, she wonders if she can change him into a likable person knowing what she knows. Seeing the promo for the second episode, we know Rebecca will meet Andy in 1995. He’s the man who she was going to marry in the present day. Before Rebecca time travels, she tells us that Andy does everything right, but she does not feel any fire. When you think about the two men in her life, one might be confused. She feels no chemistry with the gentleman, yet she wants to be with the guy who might be good in bed and seems to be controlling? But, this could be a set up for the audience. The situation is confusing, because Rebecca herself is confused. Will she come to find out Andy is the best choice for her after all? Overall, I really like this show. Ultimately, if the narrative loses some of the silly, I think this show could become the next best thing. I will be watching the second episode to see where this goes.